Two major sightings today: a chihuahua and a couple of humpback whales. 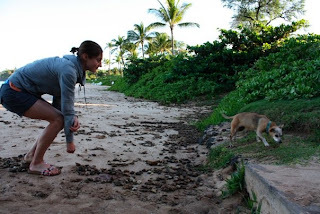 I realize that chihuahuas are not native to Hawaii nor are their sightings as rare as migrating whales, but they are equally special in my opinion. Thankfully, the whales were spotted once safe on the beach. Chef Jordan cooked up another delicious dinner: beef burgers (from Maui-raised, grass-fed cows), served over salad with fresh guacamole and some sort of yummy sweet potato hash on the side. Kyle had the "sweats" again while eating which we are learning is a clear indication of a delectable meal. Chihuahuas travel from Mexico to Hawaii each year in an epic migration which ends with mating and accompanying their resulting pups back to Mexico. 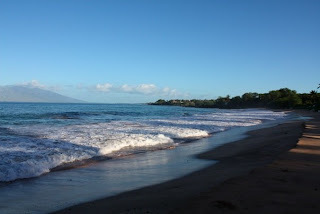 They mostly swim, or some will catch a stiff wind just off the coast of Maui or the Big Isle. :-) Train don't strain. Hawaii looks amazing. I was just wondering where you guys are staying (what town) and how you found accomadations. Great blog! We're staying in Paia and coach Joel found us the house we're renting. I'm pretty sure he did an online search for housing and found a few great options in this area. It is a perfect base for training and a neat not-so-touristy town.